The City Vijayawada location can be seeing substantial increase with regards to the commercial and professional element. Vijayawada real estate market has emerged as one of the most attractive investment destinations among Tier-II cities in India. With the kind of capital floating into the market, investors have a strong notion regarding Vijayawada to become the capital city in the years to come. Since, the government has relaxed the norms for FDI in Indian property market and SEBI has given the nod for Real Estate Mutual funds, there has been a lot of stabilization in the Vijayawada real estate market. With large investments freely flowing, Vijayawada property sector has largely become a sellers’ market, leading to unprecedented prices. 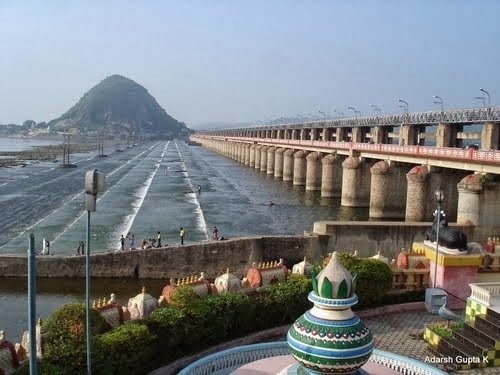 Vijayawada has witnessed around 30 per cent increase in the last 2 years and is likely to see at least 40-60 per cent increase in the next year and a half. The residential property segment in Vijayawada is growing both qualitatively and quantitatively. The speed of development in Vijayawada is an indication which is attributed to the emphasis laid on real estate construction and infrastructure. The city is fast embracing the new concepts in real estate such as Residential Townships. New houses promising highest quality construction are to come up at Vambay Colony, as the present houses have been found to be of inferior quality. The Vijayawada Guntur Tenali Mangalagiri Development Authority (VGTM-UDA) has plans to build more than 76,000 houses in Vijayawada and Tenali under Rajiv Swagruha scheme. The authority has identified 600 acres on land in Nidamanuru, Nunna, Kesarapalli and Kotturu Tadepalli areas on outskirts of the city. The UDA will also facilitate the development of a Special Economic Zone (SEZ) of Information Technology. The project will come over a 40 acre site at Amaravati Township near Mangalagiri. As such, Vijayawada retail market is moving at snail pace but can be seen to catch up the pace in future with the expected entry of brands such as Shoppers Stop and Big Bazaar among big names in shopping malls. To give a head start to the retail industry in Vijayawada, the city’s Municipal Corporation has proposed a multiplex to come over an area of 2 acres of land near Vidhyadharapuram bypass road. The project envisages serving as a hospitality and entertainment center to be executed on public private partnership basis. The corporation is likely to get 25% funding from the Center to implement the plans for the proposed center which will involve an investment of Rs 40 crore. Big Bazaar has already rented out an open site and begun the construction work on Bandar Road. Shoppers Stop and Lifestyle are looking out for suitable spaces along Ring Road. Upcoming mega shopping malls is definite to give a boost to improve the overall retail profile of Vijayawada and contribute to make it a modern city. 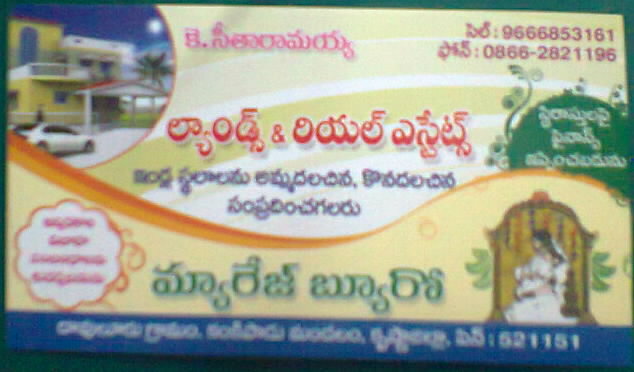 Ø non-medical staff in Dr.Pinnamaneni Institute of Medical sciences, coming from different areas of Krishna District. Apartments For Sale In Vijayawada.. Available At very Low Cost Prices With Complete Perfect Vastu.. 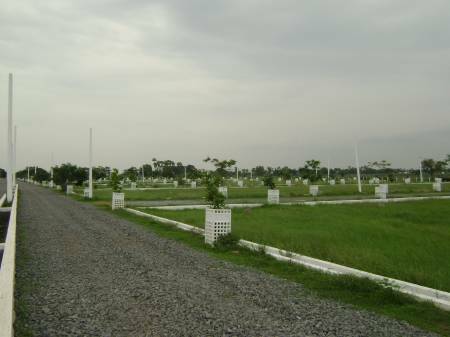 Farmland for Sale At Very low Cost Price So please Contact us Soon.. Available With Complete Perfect Vastu..
For More Information Kindly Contact Us @ (+91) 9 6 6 6 8 5 3 1 6 1 , K. Seetharamaiah. 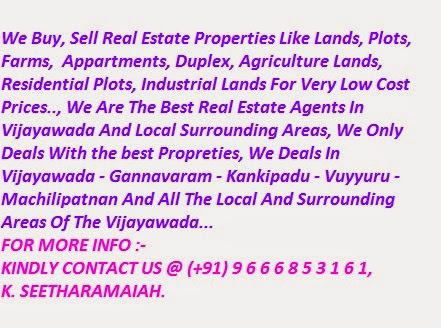 Mango gardens For Sale in Vijayawada, Available In Bulk 12 Acres Land, 1,2,3,5,7,6 Acres Land..
With Complete Vastu And Bore Well, It Is Good Suitable for residential, real Estate, Vastu..
property dealers in Vijayawada assist you to through your house deals without problems. That they not just provde the house entries within the level of house you are looking for but in addition assist you in finishing all the house sign up, house income tax, house transfer forms (in situation regarding acquire or perhaps advertise property), in the event essential.